On the morning of August 16, 2017, Haifeng Lu, Secretary-General of Global Forum on Human Settlement (GFHS) and president of Better City Institute (BCI), cordially met with Wenchang Tan, Deputy-Secretary of Party Working Committee of CPC and Director of Management Committee of Liuyang Economic and Technological Development Zone at GFHS's Shenzhen office. 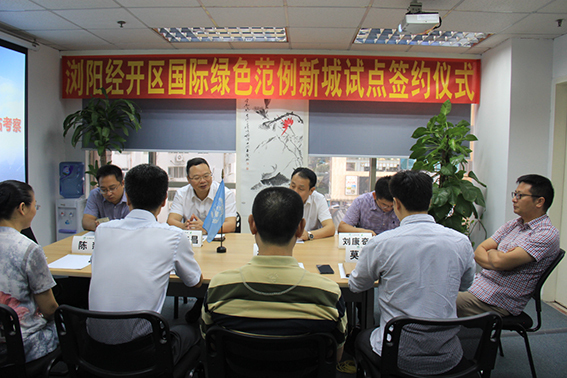 During the meeting, the two sides discussed in depth on Liuyang Economic and Technological Development Zone joining the "International Green Model City (IGMC) Initiative pilots" and signed the strategic cooperation agreement. Liuyang Economic and Technological Development Zone has since officially joined the IGMC Initiative and become “IGMC Global Partner". Moreover, it is the first IGMC pilot of industrial park in China. ▲The two sides talking friendly in details. population bring problems too, education, health care, hotels, green public space, finance and modern services are lacking in this area, while public services and living environment need to be improved as well. The leaders of Management Committee showed great foresight. 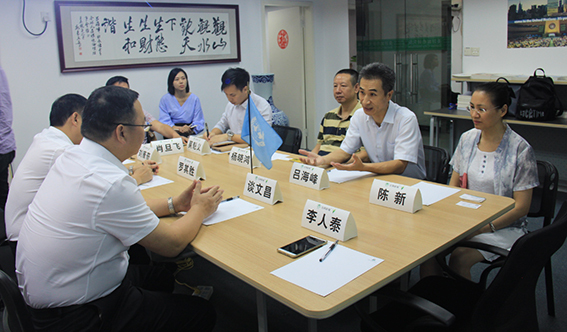 They are researching “three-year action plan” on speeding the public infrastructure facilities and services construction” and seeking to public opinions from communities and enterprises in the development zone. in order to transform into a sustainable urban area. 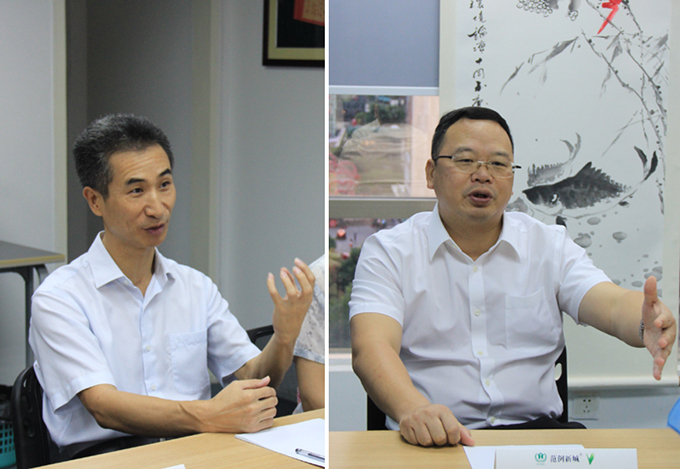 ▲Left:Haifeng Lu, Secretary-General of Global Forum on Human Settlement and the president of Better City Institute-; Right: Wenchang Tan, Deputy-Secretary of Party Working Committee of CPC and the Director of Management Committee of Liuyang Economic and Technological Development Zone. "International Green Model City Initiative” (hereinafter referred to as “IGMC”) is a greener and low-carbon city initiative launched by Global Forum on Human Settlements (GFHS) at the headquarters of the United Nations, in close collaboration with various international organizations including UNEP and national as well as local governments concerned. IGMC Initiative aims to use IGMC Standards 3.0 as one of a variety of advanced planning tools by providing innovative concepts, integrated strategies and methodologies, benchmarks and monitoring framework as well as demand-oriented solutions for assessing and guiding sustainable urban development, conducting pilots, in conjunction with other approaches, to facilitate sustainable cities and human settlements for all, and to create a shared platform for dialogue and cooperation among the global stakeholders in support to the implementation of the 2030 Agenda for Sustainable Development, the Climate Change Paris Agreement and New Urban Agenda. Furthermore, IGMC Initiative commits to China's ecological civilization and green development and contributes to the process of China’s new urbanization. The signing ceremony marks the beginning of the transformation. With the guidance of Global Forum on Human Settlements (GFHS), Liuyang Economic and Technological Development Zone will, comprehensively import IGMC 3.0 standards and implement the sustainable development vision across its 6 dimensions of environment, spatial planning and development, basic services, economy, society and culture in urban planning, construction and management.. 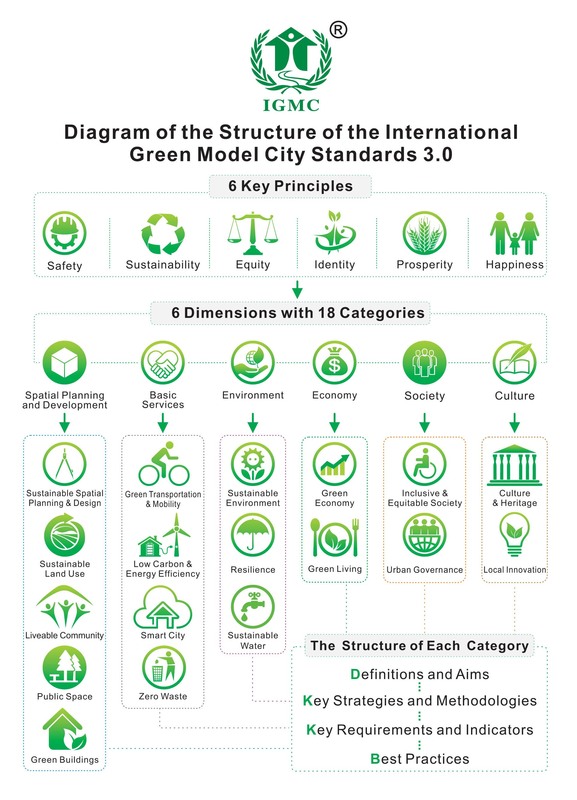 Under this cooperative framework, in collaboration with Better City Institute (BCI), and other professional institutions, Shenzhen International Green Model City Investment and Management Co., Ltd will organize the IGMC think tank and partners to provide consultative services in planning and design, technical advice, investment attraction, assessment and certification, and others based on the area’s actual needs. The expectation for the new version of the development zone is to transform it into a sustainable urban area that meets the IGMC 3.0 standards and become China's first-class "international green model city" as well as a leading case internationally within three years of hard working. Its success would also demonstrate the implementation of the 2030Agenda for Sustainable Development, the Climate Change Paris Agreement and New Urban Agenda. 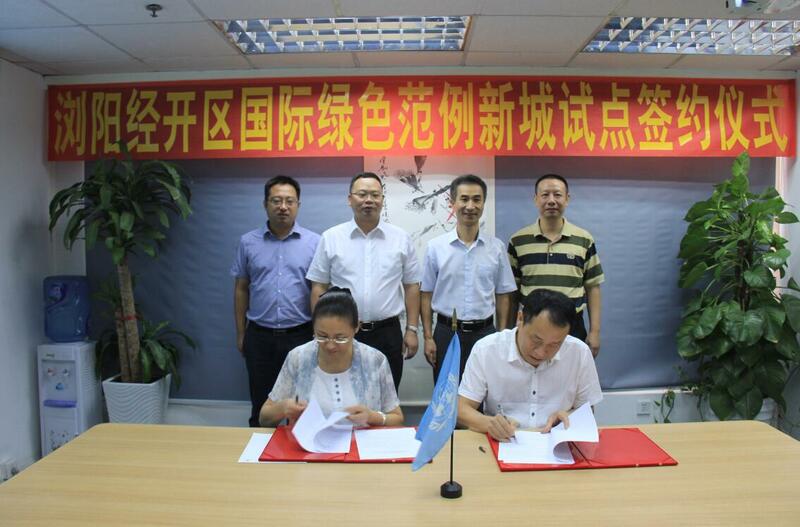 ▲Front row from right to left: QiSheng Luo, Deputy Director of Management Committee of Liuyang Economic and Technological Development Zone, and Xin Chen, General Manager of Shenzhen International Green Model City Investment and Management Co., Ltd, representing each side signed the agreement. Other attendees witnessed the moment. The other attendees from Liuyang Economic and Technological Development Zone including QiSheng Luo, Deputy Director of Management Committee, Rentai Li, Director of Planning and Construction Bureau, and Kangqi Liu, Deputy Director of General Office, and others; Xin Chen, General Manager, Xiaohong Yang, Executive Director and Kuiyi Mo, Director of Tourism Planning from Shenzhen International Green Model City Investment and Management Co., Ltd also attended.